1. Why do people study the martial arts? 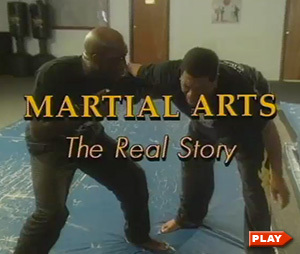 This special starts with video clips of martial artists in action and interviews with experts about the different reasons that people study the martial arts. 2. What's behind a martial art that emphasizes internal energy & relaxation? This segment introduces the "internal" martial art of Tai Chi Chuan, starting with demonstrations by Chen Yuen San, a master from Taiwan. Experts, including Robert Smith, a CIA officer well known for his martial arts writing, discuss "chi" ("internal energy"). 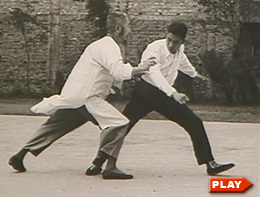 There's footage of 20th Century masters, Wong Shu Jin and Cheng Man Ching, shown doing the form and pushing hands with a young William C. C. Chen. Grandmaster William C. C. Chen, a senior disciple of Cheng Man Ching, explains and shows how the principles of Tai Chi apply to fighting. His son, Max, and daughter, Tiffany, both of whom are champion martial artists themselves, help Master Chen demonstrate boxing, kicking, and push hands. Lawrence Tan is an expert in Shaolin Animal Kung Fu, as well as a film fight coordinator, stunt man, and video director. In this segment, he shows the application of tiger, snake, leopard, and crane styles. We travel to the temple that is the birthplace of Shaolin Kung Fu, where we see monks practicing their art. This segment explores the current martial arts scene, for example the distinction between internal and external styles, and how we got here. The focus first is on wrestling as the earliest martial art and then proceeds to judo and jiu jitsu. There are some very old videos of Japanese judo experts, some of whom travelled to teach westerners, including President Teddy Roosevelt. John Bluming (a.k.a. the "Beast of Amsterdam) discusses and shows practical self defense, with an emphasis on street fighting and mixed martial arts. He's a 10th degree blackbelt in Japanese karate and a 9th degree blackbelt in judo, who demonstrates a no-nonsense emphasis on mixing strikes, kicks, throws, grappling, and leg locks. This video includes one of his students, Chris Dolman, an MMA world champion. Master Robert "Sugar" Crosson teaches self defense in Brooklyn, New York City. His focus is on a survival-oriented, no-holds barred style. On the mental side, he emphasizes the importance of situational awareness, preparation through training, and preventing escalation. 8. How do movie fights differ from real fights? Martial artist Lawrence Tan demonstrates the fundamental differences between film fighting and real fighting skills. Experts explain the need to avoid confrontation, understand reality, and know when to leave. Army Rangers train in Gracie-style Brazilian jui jitsu at Fort Benning, GA. Instructor Staff Sergeant Matt Larsen explains how learning hand-to-hand combat helps to develop fighting strategy, a vital battlefield skill. Rhon Mizrachi, the head of the Krav Maga Federation, demonstrates this system of hand to hand combat and self defense at his New York City school. Krav Maga combines western and eastern martial arts to deal with extreme attacks involving weapons, multiple attackers, and life and death situations. This video shows the emphasis on doing maximum damage to the attacker as quickly as possible. In this segment, Florendo Visitacion demonstrates the system he developed that combines Filipino styles of martial arts along with other Asian systems of self defense. His student, David James, carrying on his legacy at his school in Brooklyn New York, shows the locks and free-flowing moves of this style, and discusses the state of mind needed for effective self defense. Arnulfo Cuesto specializes in the stick fighting arts of the Phillippines. In 1985, he won the first national Filipino Escrima Competition. He's shown here at his Jersey City school training a Defensive Tactics Instructor of the New York City Police Department. This segment explores the origin and development of Savate (French kickboxing). It features Nicolas Saignac, a French Cup Champion, who teaches in the Los Angeles California area. We learn about Professor Saignac's early training and fights in France and the need to overcome fear and gain confidence. Edna Lima is a Capoeira champion, as well as a 5th degree karate black belt, who teaches Capoeira in New York City and at seminars world-wide. In this video, she demonstrates the capabilities of the kicks and head butts and discusses the emphasis on trickiness, causing confusion, hiding intentions, and the role of fakes. This orientation is explained as coming from the development of Capoeira by African slaves who had to disguise what they were doing from their Portuguese masters. This segment explores Indian and Okinawan systems that involve striking vital points. There is rare footage of Seiyu Oyata (1928 - 2012), the founder of a style of Okinawan martial art that includes strikes to the body's weak points. Paradoxically, the Indian system shown, Kalaripayattu, also teaches the use of these points for healing, and Oyata's style, Ryu-te, emphasized effective self-defense while deliberately minimizing the harm to the opponent. This segment explores the Japanese martial arts and the underlying ethical code and mental state being sought. We see training with sword and naginata, a weapon for women consisting of a sword-like blade on a long staff. There is a clip of Donn Draper, an Americans who became an expert with the sword, and there's discussion about the emphasis on self development, composure under pressure, and working cooperatively with partners to develop skills.